The 96Boards Nitrogen hardware provides support for the Nordic Semiconductor nRF52832 ARM Cortex-M4F CPU. More information about the board can be found at the seeed BLE Nitrogen website. The Nordic Semiconductor Infocenter contains the processor’s information and the datasheet. Other hardware features are not supported by the Zephyr kernel. See Nordic Semiconductor Infocenter for a complete list of nRF52-based board hardware features. 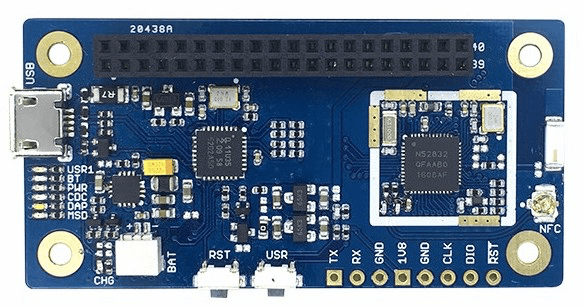 nRF52 has two external oscillators. The frequency of the slow clock is 32.768 kHz. The frequency of the main clock is 32 MHz. 96Boards Nitrogen has one UART, which is used as Zephyr console. Default settings is 115200 8N1. The 96Boards Nitrogen board can be flashed via the CMSIS DAP interface, which is provided by the micro USB interface to the LPC11U35 chip. Using the CMSIS-DAP interface, the board can be flashed via the USB storage interface (drag-and-drop) and also via pyOCD. Error: There is no board connected. Finally, unplug and plug the board again. As described by pyOCD issue 259, you might get the ValueError: The device has no langid error when not running pyOCD as root (e.g. sudo). To fix the above error, add the udev rule shown in the previous section and install a more recent version of pyOCD. Here is an example for the Hello World application. This requires installing the pyOCD Debug Host Tools. Replace <tty_device> with the port where the board 96Boards Nitrogen can be found. For example, under Linux, /dev/ttyACM0. The -b option sets baud rate ignoring the value from config. You can debug an application in the usual way. Here is an example for the Hello World application. This also requires pyOCD.